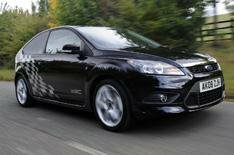 Ford Focus Zetec S gets sports styling | What Car? Ford has introduced a new, sporty trim level to its Ford Focus. Called Zetec S, it is based on the current three- and five- door Zetec models, but adds front and rear spoilers, and lower sill extensions, 17-inch alloy wheels and aluminium-style pedals. The sports kit costs an additional 750 over the equivalent Zetec model, but the extra kit is worth 1600 if bought separately. Two other styling packs are available. The Sport pack costs 500 and adds 18-inch alloy wheels and privacy glass, while the WRC pack costs 200 and includes World Rally Championship chequered flag decals and sill scuff plates.